Sweet stuff in sausages whatever next! Only joking. We've tried pork & mango and that was good with some chilli, so let's give pork & marmalade a go too! 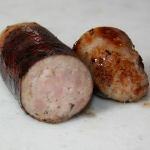 The Churchgate Sausage Company of Old Harlow, Essex do produce and sell some particularly interesting examples of sausage delight using all sorts of ingredients and flavours. These Pork & Marmalade are just such. 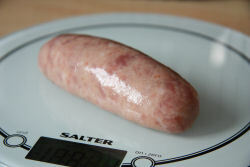 Quality pork meat mixed with a good measure of premium marmalade, in natural casings, oh yes, these are the makings of a notable sausage. We decided that these were just like Churchgate's Classic Pork in taste and texture but with the added marmalade, the result is a step up and is something that really needs to be tried. Most excellent! Moist and slightly tangy, with a medium smooth texture and a lovely bite. Ok a little caramelising of the skins in the cooking with the marmalade oozing through, but hey, I can live with that! 110x35mm before cooking, 100x36mm after. 88g before cooking, 81g after. That's a shrinkage of 6% & weight loss of approx 8%.